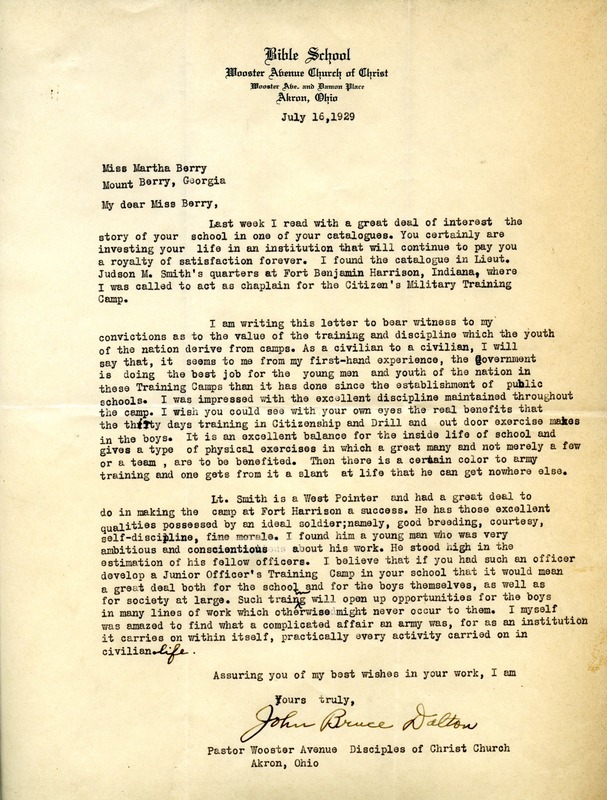 This letter from Pastor John Bruce Dalton describes the merits of a Citizen's Military Training Camp and recommends that Miss Berry develop a Junior Officer's Training Camp at Berry. He describes their diligence and excellent discipline with great praise and admiration, and goes on to explain how beneficial this would be to the school's program. John Bruce Dalton, “Letter to Martha Berry from John Bruce Dalton.” Martha Berry Digital Archive. Eds. Schlitz, Stephanie A., Jessica Hornbuckle, Camille Hanner, et al. Mount Berry: Berry College, 2012. accessed April 25, 2019, https://mbda.berry.edu/items/show/9886.